February 8th 2014 – I have been writing fishing reports since the mid nineties for Key West and the Florida Keys.. It always makes me grin when I have the pleasure of that date and saying TARPON. In the past week or so Key West has been flooded with nice sized tarpon pushing in from the Gulf to feed on our copious amounts of bait here in our waters. The tarpon are moving along the edges and in the channels laying a little low but not unnoticeable. Certainly not a time to fly fish for them but a great time to get your early season tarpon fix on using live bait and strategic boat placement. Is This The Beginning Of Tarpon Season? We hope not. We are hoping that the tarpon are here and we get some more cold weather, then gone till March or so when they can come in super heavy and set up things for the migration in May. 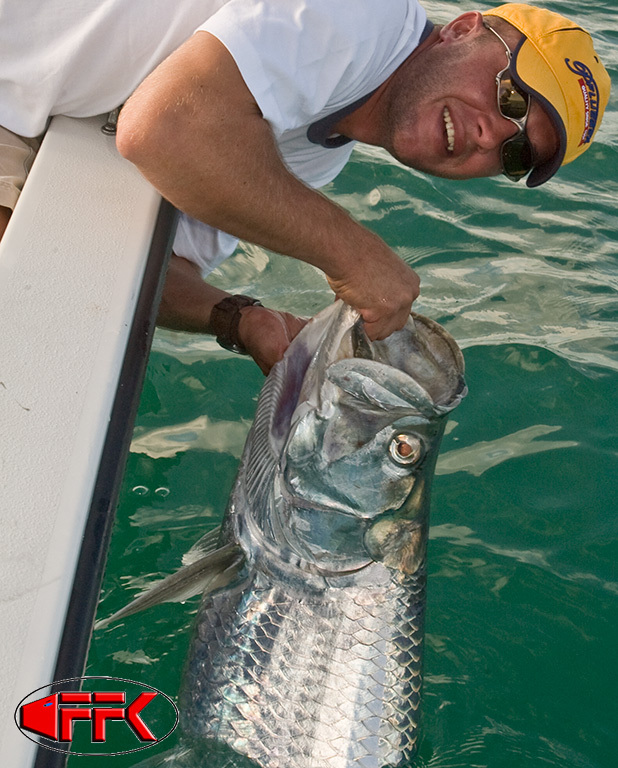 Winter tarpon tend to be quite large with a few exceptions. Frankly I would much rather show my client a couple of 40 lb fish than a single 120 lb tarpon any day of the week. Seeing as the fish are hard to photo no matter what size they are the smaller fish seem to make it a little easier. We are booking fishing charters for backcountry fishing here in Key West but not for Tarpon fishing just yet. However we will look for the tarpon and try and get you an early season shot, We just won’t book a trip based on it just yet.